Contrary to the ominous picture painted by Donald Trump, America has once again emerged as a port of safety for investors navigating the stormy world. The U.S. stock market is sitting near record highs and the Dow is up an incredible 3,100 points since the mid-February low. A big factor powering the move: the U.S. is looking like a haven of stability amid all the global turmoil. And investors are betting on that safety with their dollars. Just look at the laundry list of global concerns: deep uncertainty sparked by Brexit; renewed European bank concerns; low oil prices hitting energy-centric economies like Brazil; unnerving emergency moves by the Bank of Japan and fresh memories of market turbulence in China. That's not to mention the coup in Turkey, a former darling of Eastern Europe. "Who's left standing? We're not the least worst now. We're best," said David Kotok, an influential money manager who cofounded Cumberland Advisors. Another forceful driver of the rally on Wall Street is that investors don't have that many choices right now, and stocks look great next to bonds that are yielding next to nothing these days recently. With all these factors at play, investors have rewarded America with far richer valuations than its peers. The U.S. MSCI index of U.S. stocks trades for a lofty 17.4 times estimated forward earnings, according to Yardeni Research. That's the equivalent of a massive vote of confidence when compared with more conservative multiples assigned for the U.K. (15.9), Eurozone (13.4) and Japan (13.1). More recently, money has started rushing into emerging markets. But these less mature economies remain cheap. The MSCI emerging market index is trading at just 12 times forward earnings. 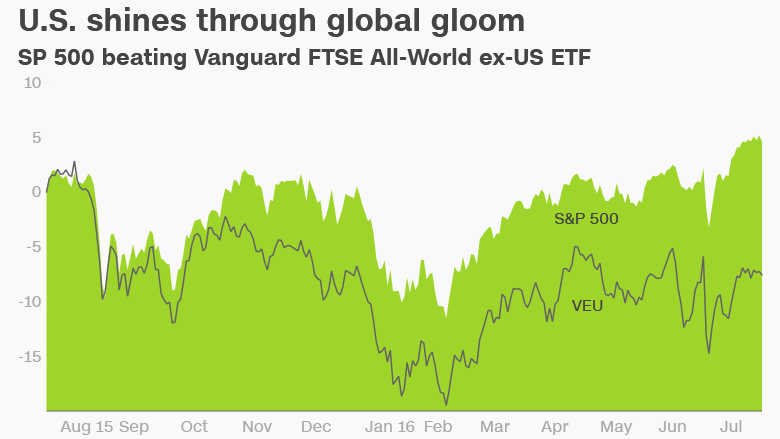 The Vanguard FTSE Emerging Markets ETF (VWO) is not even close to its pre-Great Recession highs, despite a 12% rally this year. So even though U.S. stocks are pricey -- and many would say outright expensive -- investors have been willing to pay up for the stability. "Where do investors go? It's all a relative game -- and the U.S. looks relatively attractive," said Casey Clark, vice president of investment strategy research at Glenmede Trust. Interestingly enough, just a few months earlier, there were fears of a near-term recession in the U.S. as the year kicked off with very slow growth in the economy. But those have faded in recent months. While "angry politicians on both extremes will say the country is headed in the wrong direction" JPMorgan Funds chief global strategist David Kelly believes the numbers say otherwise. "This tortoise-like expansion is generating steady growth, low unemployment and record level of wealth," Kelly wrote in a client note. "Logic still suggests this is still a good time to be invested in risk assets." Of course, just because the U.S. has been looked at as a safe haven doesn't mean it will stay that way indefinitely. 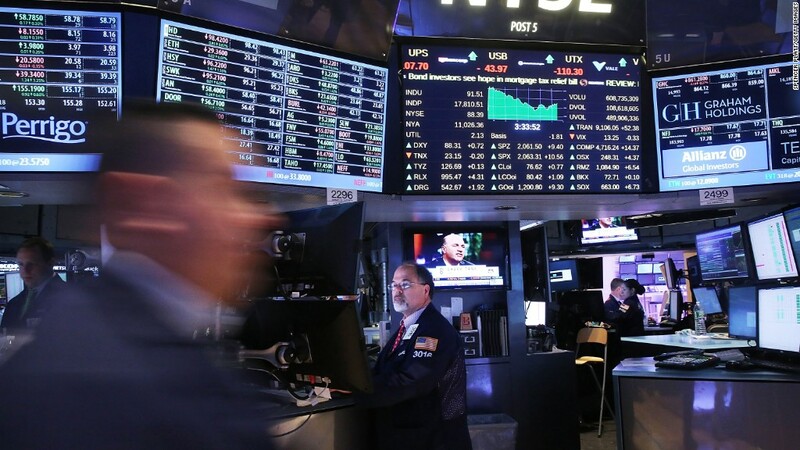 First, many have warned that stock market valuations in the U.S. have gotten stretched and a pullback may be coming if earnings don't improve significantly. David Bianco, chief equity strategist at Deutsche Bank, believes a 5% to 9% "dip" in the S&P 500 is "likely" given that investors "seem too excited about improving growth" and have become "complacent" about low bond yields. "We think the bull continues, but patience will be rewarded," Bianco wrote in a note on Monday. And then there's the looming U.S. election. Up until now, investors have not been spooked by the possibility of Trump taking the White House. Either they don't think he'll win or they believe his tough talk on trade is just bluster. Will that thinking change given that new polls, including a CNN one released on Monday, show support for Trump is on the rise after last week's GOP convention? Stay tuned. "Now we have our own political theater unfolding. We're going to have massive volatility because of politics," said Cumberland's Kotok.